Kenya on Sunday experienced earth tremors at around 7.20 pm. The tremors were felt in several counties including Mombasa, Nyeri, Makueni, Kiambu, and Nairobi. Meteorological services said the tremor was also felt in Naivasha and Nakuru. 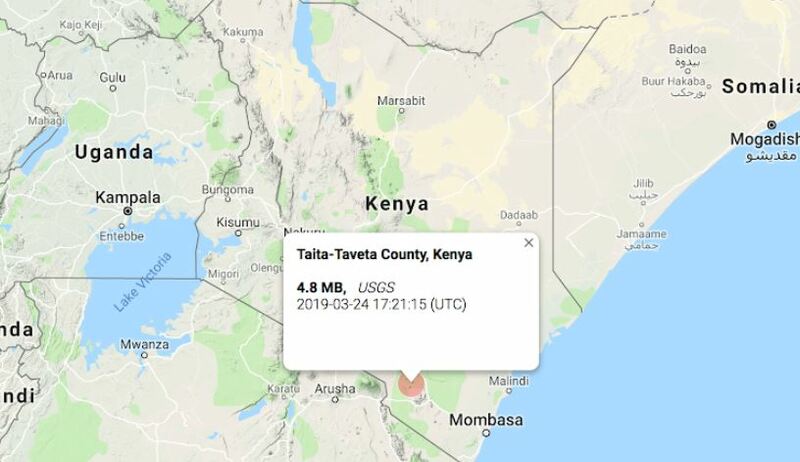 According to the USGS, an earthquake hazard programme, the earth tremor was measured at a magnitude of 4.8 and a depth of 9km, 41 km NNW of Wundanyi, in Taita Taveta County. The Kenya Meteorological department noted that no significant damage was caused. Residents at the Coast were also advised to seek higher ground and leave low lying areas near the beach until given an all-clear after geologists pinpoint the epicenter of the earth tremor. On Twitter, Kenyans in their droves shared their experiences and as you would expect, some found humor in the rare seismic activity. watch out for conman Prophet Dr David Owuor take credit for the #tremor felt in Nairobi. Such a charlatan. I am in Kenya and I felt the tremors. who also feels uhunye should give us a holiday to nurse the trauma? BREAKING: DP William Ruto has denied that no #earthquake has occurred in Nairobi and other parts calling it fake news. Meanwhile Redcross to ask for more funds to control the tremor situation. Tweep 1: Is it just me or did you guys hear that trumpet? Tweep 2: Haiya, some guy on a horse flew past my window blowing a trumpet! I am in Thika and I felt the tremors.